Pantone's color of the year is Serenity (light blue) and Rose Quartz. I absolutely love this soft pastel shade of pink because it's such a feminine pink and one of my favorites. I'm sure it will appear more in spring/summer collections, but here are some ways to incorporate them in winter. I'm a big statement necklace gal and let me tell you that they are a great way to add a hint of color to your outfits if you tend to wear neutrals. Here are some of my recent purchases that I'm excited to rock. Zoya had a sale last month where four bottles of nail polish were only $15 with free shipping! I picked up Kennedy which is described as "a full coverage, pale, french beige cream". If you look at the bottle the color doesn't look very impressive, but it's the perfect shade of pale pink on my skin tone. This is the shade I wore for Valentine's Day. It's a lighter shade of my other favorite pink Amanda. I've been in the market for a new handbag for awhile but I'm not the type of person who collects them. I buy one every year or so and sport it daily until it wears out. But I was watching the Real Housewives of Beverly Hills where the ladies were making fun of Eileen's bag. See Eileen, like me, pays little attention to her bag and sports old bags. Kathryn said she always looks at a woman's shoes then the handbag which polishes the outfit. I think that's true because whenever I look at fashion bloggers, the finishing piece to their outfit is their handbag. Michael Kors was having a sale and I got this pink Selma bag for 50%. 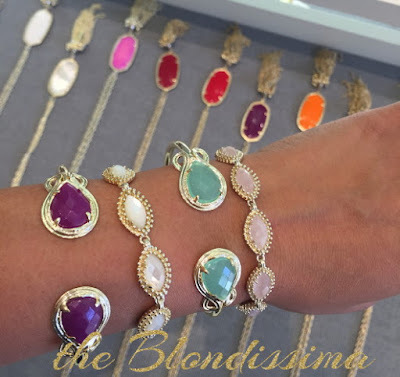 Kendra Scott is my favorite jewelry line and for your birthday, you get 50% off one item. So I visited the store and tried on just about everything having a hard time trying to pick out just what I want. I ended up with the Andy bracelet in rose quartz. It's such a beautiful jewel tone color I think I need the necklace and earrings too! How many bracelets does it take to make your wrists happy? Last year's color was Marsala which I didn't really wear or see much of in stores. What do you think of the color Rose Quartz? Will incorporate it into your wardrobe this year? Very pretty jewelry! Love the shoes and bag! And the colors! I was so excited to hear that Rose Quartz is the color of the year, mostly because the crystal symbolizes unconditional love towards others and towards one's self. I'd love to get my hands on that Zoya nail polish you mentioned! Oh wow I didn't know that about its symbolism. I was so surprised that Pantone picked two colors for this year! I think it should have just been rose quartz :) Love this shade, and anything blush pink! Kendra Scott is my new fave, but I have yet to own anything of hers. I'm still soaking up the usage of her stuff from Rocksbox. I do have that Michael Kors Selma bag, in a very similar (but more blush) color! Definitely makes for a fun pop of color this spring. I'm a rocksbox fan too! I am obsessed with this color! I really want a handbag in it too! 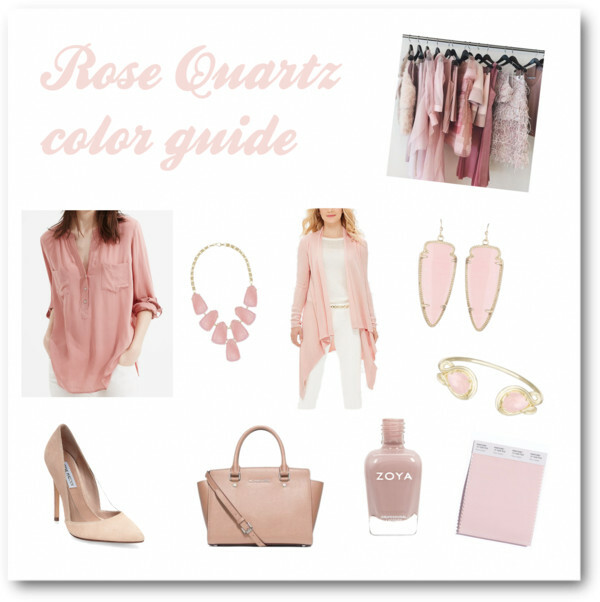 I'm loving rose quartz for spring! I have the perfect Kate Spade purse to kick my spring off right. I'll also be taking a stop in Kendra Scott to maybe get that bracelet...it's gorgeous! Yes you must get the bracelet! Love this! Pantone's colors this year are gorgeous, I also love Kendra pieces! They're such great quality! Oh, I love that purse and that nail polish! Such a beautiful color!